Squash & pumpkin season is fully upon us and Thanksgiving is now just weeks away. Time to play about with new recipes using seasonal produce and so, how about: a fluffy Sformato using uber-seasonal pumpkin? Preheat the oven at 180°C & Let’s start with the pumpkin. 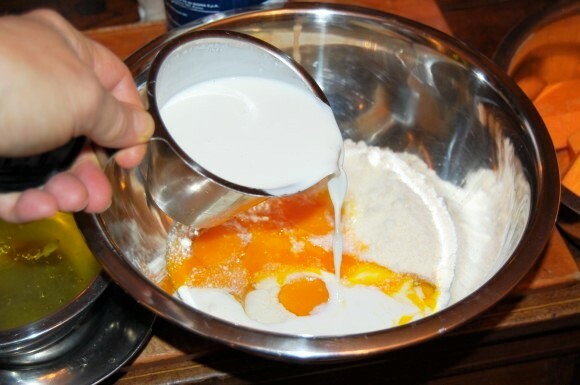 Separate (4) egg yolks from the egg whites and measure out all your ingredients. Crush the garlic and put into a skillet with some olive oil, then slice the pumpkin into cubes and sautée until tender, which will require cooking them on a low heat with the lid on to help them cook through. 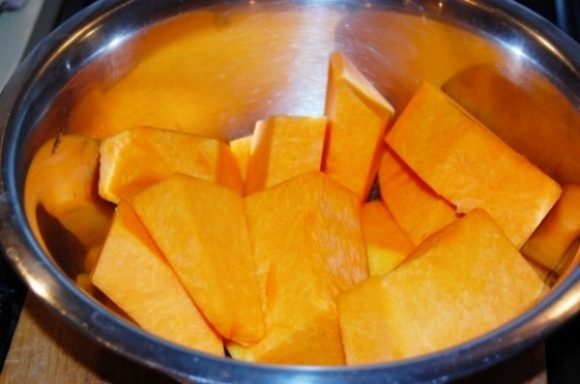 Once cooked, remove the pumpkin from the pan and place in a large mixing bowl. Use an immersion blender to process the pumpkin into a purée and add salt & pepper. Now it’s time to make the Sformato batter. 1. 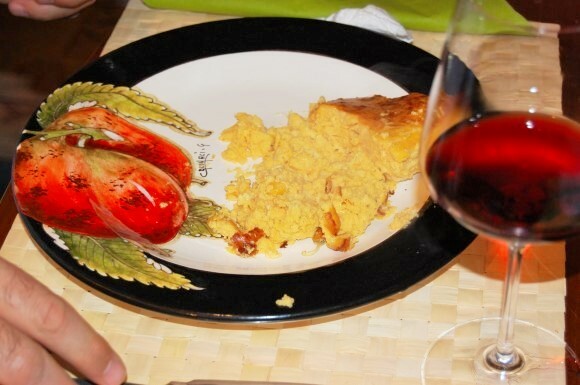 In a bowl, put (2) whole eggs, (4) egg yolks and grated Parmesan cheese. 3. In another bowl, beat the (4) egg whites with an electric beater. 4. 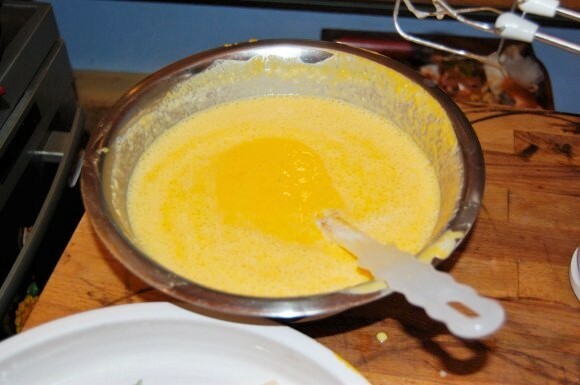 Then add beaten egg whites and pumpkin purée to the egg, Parmesan & cream mixture and mix all ingredients together, finally, to form a batter. For whatever reason (probably the size of the eggs), I found that the batter was slightly too liquid for comfort. I therefore decided to add two spoonfuls of cornstarch to the batter to serve as a thickener. It worked! I put 2 spoonfuls of cornstarch into a bowl and added a ladle of batter to mix it in before putting it all back into the batter. 5. Butter the inside of this beautiful Bella Frutta oven-proof dish. Cut the Fontina cheese into cubes and spread evenly over the dish. Add a clutch of sage leaves or other herb you may prefer to use (e.g. rosemary or thyme or marjoram). I also added a few peppercorns. 5. 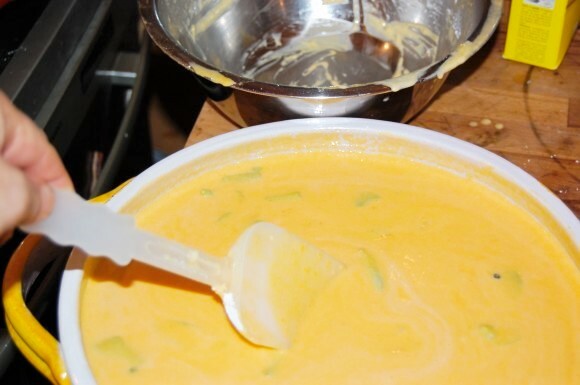 Pour the batter into the Bella Frutta oven-proof dish and mix gently. 6. Bake in the oven for 25 to 30 minutes or until firm. Not all ovens are equal and the cooking time will depend on the type of oven. This is a fan assisted oven. Expect comments of oohs & ahhs as you uncover the dish! P.S. 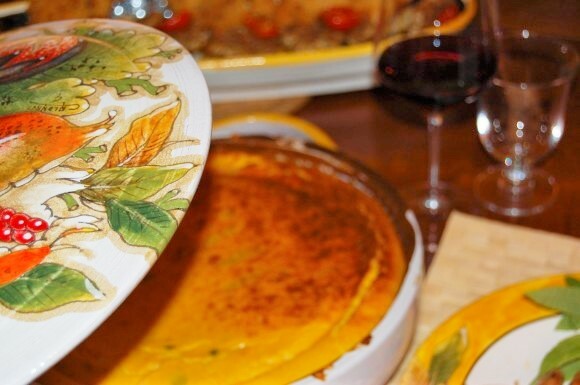 This Pumpkin Sformato can be eaten either as a starter or as a side dish. 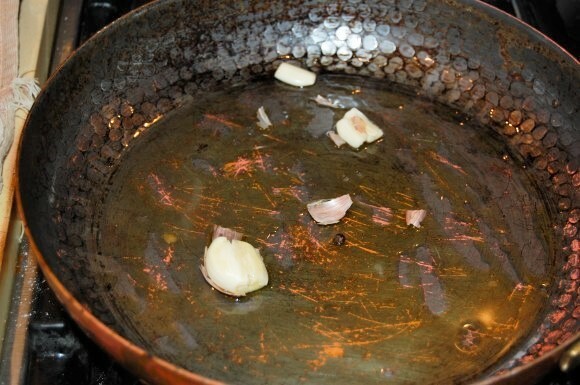 Any leftovers will go very well with a nice, crisp salad!